Take $1000 per person off on board the Akademik Ioffe and contact us for further discounts with this Cruise Company. This exciting new expedition has been many years in the making. It is undoubtedly the most comprehensive journey to Antarctica ever offered. 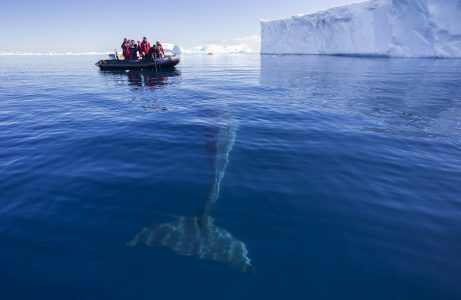 This unique experience links two existing voyages to create one ‘super adventure’. 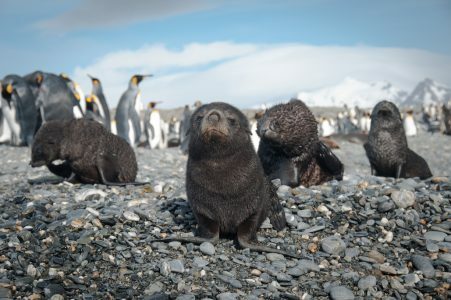 Over the course of three weeks, we spend an unprecedented 16 days exploring the Antarctic Peninsula, South Shetland Islands, the spectacular, icy Weddell Sea region and the wildlife-rich Falkland Islands. 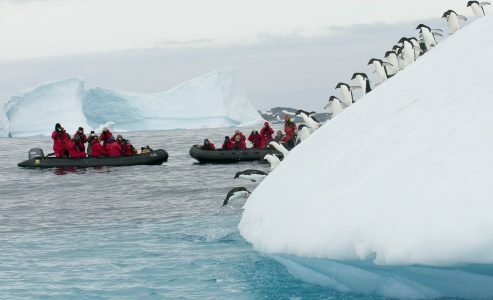 This 21-night voyage is a combination of the 10-night ‘Quest for the Antarctic Circle’ voyage, and the 11-night ‘Ultimate Antarctica – Weddell Sea and Falklands’ voyage. 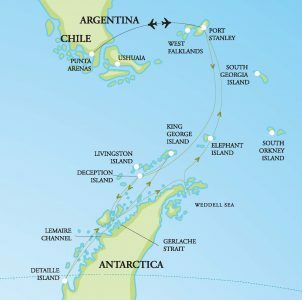 Your trip starts and finishes in Punta Arenas, and includes the flights to and from Stanley, in the Falkland Islands. On Day 11, the ship will be anchored at King George Island. Some of your fellow passengers will disembark here, at the completion of the 10-night voyage and fly back to South America. Others will join for the 11-night trip as we make our way back to the Falklands. As this voyage is comprised of two shorter expeditions, it is likely we will visit a number of our favourite locations for the second time, such as Deception Island and Neko Harbour. These are such beautiful spots, with a range of different shore activities, it will be a thrill to experience these places at different times, in different weather and in different moods. This combination trip offers incredible diversity and provides a huge variety of onshore experiences, at dozens of unique landing sites. * Includes return flights from Punta Arenas to Stanley and from Stanley to Punta Arenas. Our epic journey commences this morning in Punta Arenas. Here we board our 90 minute flight to Stanley in the Falkland Islands. We are met on arrival and transferred to the pier. Stanley is home to 2,000 residents and is reminiscent of a charming rural town in coastal Britain, with brightly coloured houses, flower-filled gardens, a quaint cathedral and several local pubs. There will be time to explore the town before embarkation. Excitement is in the air as we cast off, bound for Antarctica, and the adventure of a lifetime. We chart a southerly course for Antarctica. This stretch of the South Atlantic is rich in marine life and showcases an abundance of wildlife. We will be joined by hundreds of seabirds including the wandering albatross. Giant petrels and smaller Cape petrels are also constant companions as we make our way south. Photographing these magnificent birds from the deck of the ship takes patience and skill and our photography expert will be on hand to show you the best techniques. Join the ship’s Captain on the bridge and learn about the operations of our modern research vessel. Throughout the day our onboard experts educate us with a series of presentations about the environment, the wildlife and history and the locations we hope to visit in the coming days. This morning we are in position at the northern end of King George Island – the largest in the South Shetlands group. Penguin Island and nearby Turret Point offer good opportunities for shore landings to view Adelie, chinstrap and gentoo penguins. Southern giant petrels, kelp gulls and Antarctic terns are also known to nest here. This afternoon we continue our journey south making our way ever closer to the Antarctic coastline. 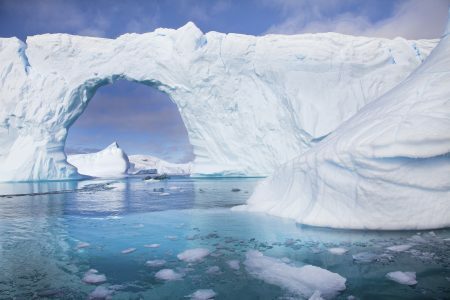 Large icebergs will be present from this point onwards and make for striking photographs in the evening light. By morning, the towering mountain peaks of the Antarctic continent loom into view and we should make landfall around Wilhelmina Bay. 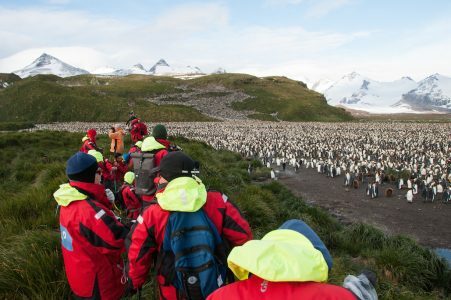 We navigate under the towering cliffs of Spigot Peak and into the Errera Channel hoping for a shore landing at Cuverville Island – home to a rookery of Gentoo penguins. It’s a fantastic location for a zodiac cruise or a paddle in the sea kayaks. We pass through the ice strewn waters making our way towards our ultimate objective, the Antarctic Circle and into Crystal Sound. A favoured landing site here is Detaille Island, home to an abandoned British science hut from the 1950’s. This vicinity marks our turnaround point to head northerly, exploring the Antarctic Peninsula. We hope to visit a working scientific base to learn something of the important climate-related research happening here. A hike over the snowy saddle of nearby Winter Island allows us to stretch our legs and explore a historic British Antarctic Survey hut. Petermann Island is home to an Adelie penguin rookery. The view to the north of Mount Shackleton and Mount Scott is impressive. These towering granite sentinels mark the southern entrance to the nearby Lemaire Channel. Pleneau Island offers more opportunities for shore landings. Just offshore, massive icebergs run aground in the shallows. Constant wind and wave action sculpt these gargantuan chunks of ice into fantastic shapes, revealing more shades of blue than you can possibly imagine. For many, a Zodiac cruise here may well be a highlight of the voyage. We cruise north towards Paradise Harbour. This may be the first opportunity to step foot on the continent of Antarctica itself. Nearby Neko Harbour offers another continental landing. By morning we arrive in the South Shetland Islands towards Whalers Bay at Deception Island, a very dramatic place and history are all around us as we explore the old whaling station. This is where Australian explorer and pioneer aviator, Sir Hubert Wilkins made the very first flight in Antarctica in 1928. This morning we are anchored off King George Island. You will say farewell to many of your fellow passengers as they disembark, transfer to the airstrip and board their charter flight back to South America. There will be an opportunity to go ashore, or you may wish to relax on board, updating the diary or visit the multi-media room to download and back up your images. New guests are welcomed aboard the ship and we are soon underway – for the second leg of our epic adventure. The Gerlache coastline is one large polar ‘playground’ with a great variety of landing sites. As always the weather and ice will dictate our route. Planned visits could include Port Charcot, Orne Harbour or Andvord Bay. All three locations offer excellent hiking opportunities, or a cruise through the Errera Channel to and land on Danco Island – a large dome shaped island affording terrific views of the whole region from its summit. If the channel south of Brooklyn Island is ice-free, we may ship cruise through here as we push to the north into the broad expanse of the Gerlache Strait. Cierva Cove and Mikkelsen Harbour are also possible locations we could visit – both providing good Zodiac cruising opportunities. We are now on our way towards Antarctic Sound – the gateway into the icy Weddell Sea. On our port side, will be the South Shetland Islands. It won’t be the first time you have cruised these waters, but there are some terrific sites here which we may go and explore. Half Moon Island is nearby and is home to a sizeable chinstrap penguin rookery. 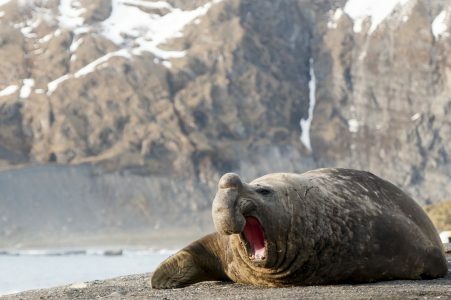 Across the MacFarlane Strait is Yankee Harbour – with its broad pebble beach – a known location for Weddell seals. If the weather is good, a second visit to Deception Island is also a possibility. It’s always a thrill to navigate the ship into ‘Neptune’s Bellows’ – and to explore inside the submerged volcanic caldera by ship and Zodiac. As we sail into the sound we witness, for the first time the vast sweep of the Antarctic icecap. It is an awe-inspiring sight. Heading into the Weddell Sea we notice a significant increase in the number of huge tabular icebergs and the presence of sea ice. The Weddell Sea region is home to Adelie penguin rookeries of staggering size – some contain more than 100,000 nesting birds. Such colonies dwarf the rookeries we have visited so far. Weather permitting, excursions may include Hope Bay, Paulet Island and Brown Bluff. All eyes will be trained on the ice floes through which we navigate the ship. We have enjoyed successful sightings of emperor penguins in this area in recent years. The history of exploration in this region is incredibly rich. Remnants of Nordenskjöld’s Swedish expedition of 1901-1904 are found in several locations in this area. The epic century-old story of Shackleton and the HMS Endurance expedition has strong links to the region. We approach Elephant Island on the southern tip of the island, is home to an impressive chinstrap penguin colony. If conditions permit, we may visit the fabled location of Point Wild on the north coast. It is here that Shackleton and his men were encamped under their upturned lifeboats before five men set off on a rescue mission to South Georgia. While sailing north to the Falkland Islands our onboard polar experts will recap on our Weddell Sea adventures and prepare us for the final days ahead. The spectacular seabirds including several albatross and petrel species once again join us and are our constant companions as they soar above the ship. Arriving into the Falkland Islands overnight, we explore the islands of West Point and Saunders, both in the West Falkland archipelago. West Point is known for its rockhopper penguin rookeries and large nesting black-browed albatross colony. In the early morning, we navigate through the narrows and into our port. Stanley is currently home to just over 2,000 residents and is reminiscent of a rural town in coastal England or Scotland. There is time to explore the town before we make our way to the airport for our return flight to Punta Arenas in southern Chile (this flight is included in the price of your voyage). Includes return flights from Punta Arenas to Stanley and from Stanley to Punta Arenas.